The ankle joint is a synovial, hinge joint. The ankle joint only moves in dorsi and plantar flexion. 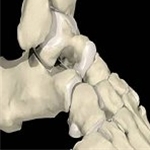 Movements of inversion and eversion take place in the talocalcaneal joint. Bones The ankle joint is formed by the distal ends of the and fibula with the talus (Fig. 1). 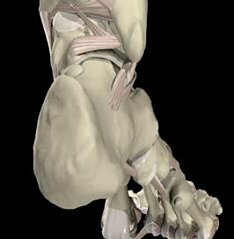 The talus is the second largest bone in the tarsal region. 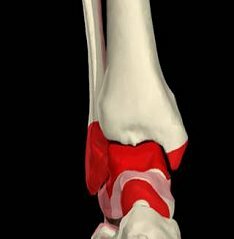 It lies between the medial and lateral malleoli and articulates superiorly with the tibia and fibula to form the ankle joint. Distally it articulates with the calcaneus (heel) at the talocalcaneal joint. An anterior distal attachment with the navicular creates the formation of the talocalcaneonavicular joint. 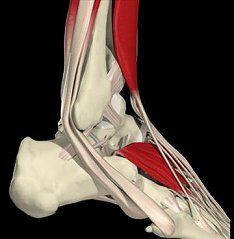 A significant number of ligaments attach to the calcaneus, however no muscles or tendons attach to it. The articular surface of the distal tibia, the articular surface on the medial aspect of the fibular malleolus and the articular surfaces on the body of the talus are covered by a variety of hyaline cartilage termed articular hyaline cartilage (Fig. 2). These surfaces form the talocrural (or ankle joint) a synovial articulation. Articular cartilage also covers surfaces of all the articulations in the foot: the talocalcaneal joint, the talocalcaneonavicular joint, the calcaneocuboid joint, the tarsometatarsal articulations, the metatarsophalangeal articulations, and interphalangeal articulations. 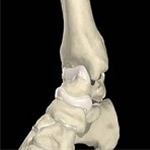 Articular cartilage provides a smooth surface allowing easier joint movement. The hyaline cartilage in the ankle joint varies in thickness and possesses an amount of compressibility and suppleness. The surface of articular cartilage is lubricated by synovial fluid secreted by the synovial membrane lining the inner surface of the joint capsule. 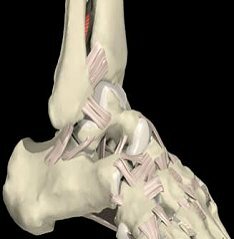 The calcaneus (heel) is the largest of the tarsal bones and forms the heel of the foot (Fig 3). The calcaneus articulates with the cuboid and talus. It is often fractured by direct vertical force, as when landing on the heel in a fall from a height. 1. The anterior talofibular ligament (Fig. 3) is attached to the anterior border of the lateral malleolus. It is the least strong of the three components of the lateral ligament of the ankle joint. 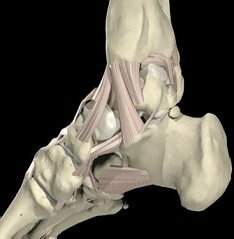 The anterior tibiofibular ligament is a firm, fibrous and flattened band. 2. 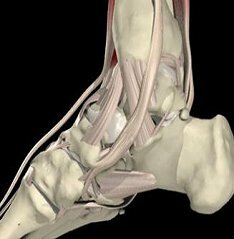 The posterior talofibular ligament is the strongest of the three components of the lateral ligament of the ankle joint, (Fig. 4). It is approximately triangular in shape. 3. Posterior (posterior tibiotalar) part. Tendons connect muscles to bones. The Peroneus longus is one of two tendons in the lateral (peroneal) compartment of the leg; the other tendon being peroneus brevis (Fig. 6). Together, they run behind the lateral malleolus and turn forward below the lateral malleolus to run on the lateral surface of the calcaneus. Peroneus longus everts the foot, and is capable of plantar flexing the ankle joint; it also helps to support the lateral longitudinal and transverse arches of the foot. The peroneus brevis, in conjunction with the peroneus longus is also an evertor of the foot. It is also a weak plantarflexor of the ankle joint and foot. The Tibialis posterior (Fig.7) originates on the posterior lateral tibia and attaches at the navicular. It is an invertor and primary stabilizer of the hind foot. It also assists plantar flexion and aids in stabilizing the medial ankle. 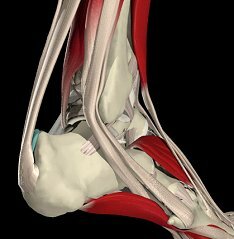 Achilles tendon (Fig. 8) is the strongest and thickest tendon in the body. It connects the heel with the calf muscles and is a plantarflexor of the ankle joint and foot. The Achilles tendon is susceptible to rupture just above the os calcis. This is especially prevalent in active middle-aged males. Shop our selection of ankle braces and supports for ankle sprains and instability, the most common ankle injuries. Read more.. Most ankle sprains involve the ligaments that surround the ankle joint, but a high ankle sprain refers to the ligament above the ankle joint referred to as the syndesmotic ligament. Read more..
Ankle arthritis is the leading cause of disability in the USA. Ankle arthritis usually occurs from wear & tear, rheumatoid arthritis or post-traumatic arthritis. Ankle arthritis causes pain Read more..
Shop ankle compression sleeves to help reduce inflammation and pain from ankle tendinitis / peroneal tendinosis overuse injuries. Read more.. Learn more about shin splints, including the common causes, symptoms, treatment suggestions for pain relief Read more..
© Ezywrap 2019. All Rights Reserved.